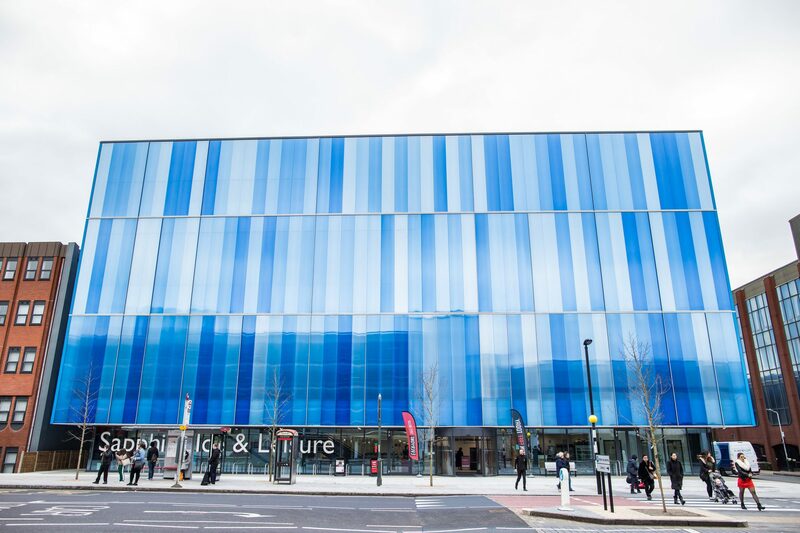 REL Building Services has completed the electrical works for Romford’s £28m Sapphire Ice and Leisure Centre. Appointed by Kershaw Mechanical Services, REL was responsible for the £2m electrical elements of the project, which took 12 months to complete. Both the ice rink and swimming pool were in a double height space, so the lighting had to be installed seven metres high. In the ice-rink, REL used high-bay LED luminaires coordinated with AV equipment gantries to ensure uniform lighting over the rink and minimise glare, which is essential for sports events. Outside of the building, REL was responsible for delivering the lighting which emphasises the architectural cladding. The team had to create a vertical ribbon of light at specific points, comprising a watertight LED strip just 16mm wide. REL also advised on the use of cool-white LED lights to set off the blue panelling and give maximum impact. The Sapphire Ice and Leisure Centre is one of several leisure projects which have been completed by REL Building Services in the last 12 months. The team has also helped to deliver leisure complexes in Waltham Forest in London, High Wycombe in Buckinghamshire and Flitwick in Bedfordshire.